Amber Arden is a Fashion Stylist, Costume Designer, and Milliner based in Los Angeles, Ca. Known for her Snow White Mashup costumes and all things Disney & Star Wars. She also creates cosplays inspired by Anime all the way to Vintage Classic Characters. Designing and cosplaying for over 4 years, she frequently is a Fashion Stylist for Disney Style, Hot Topic, and many fashion brands to date. While coordinating numerous photo shoots involving all aspects of fashion & costume. Known for her Mashup Armored Costume Snowbafett, a Boba Fett inspired Snow White, she Generated a 30+ army of Armored Disney Characters. Amber was a Panel Guest at Star Wars Celebration and Anime Expo. Featured in magazines and blogs like Huffington Post, LA Weekly and Cosplay Culture Magazine. Ryann Kay is an Arizona costume designer, cosplayer, and artist. She started working as a theatre costume designer at the age of 18, and from the moment she discovered cosplay 3 years ago costuming changed from a job to a true passion. Since then she has created over 50 unique cosplays based on anime, comics, video games, and everything in between. Widely recognized from her cosplays as Azula from Avatar the Last Airbender, and Astrid from How to Train Your Dragon, she is always looking for new adventures and ways to bring her cosplays to life. From music videos to choreographed fight sequences and even acrobatic performances on a Lyra hoop. Her core belief is that there is no right or wrong way to cosplay, it’s up to each individual to interpret their own character. Fantasy’s Heart and Soul are a cosplay duo hailing from Arizona and Alberta. Friends since 2002, these two began building cosplays together in 2012 and they never looked back. 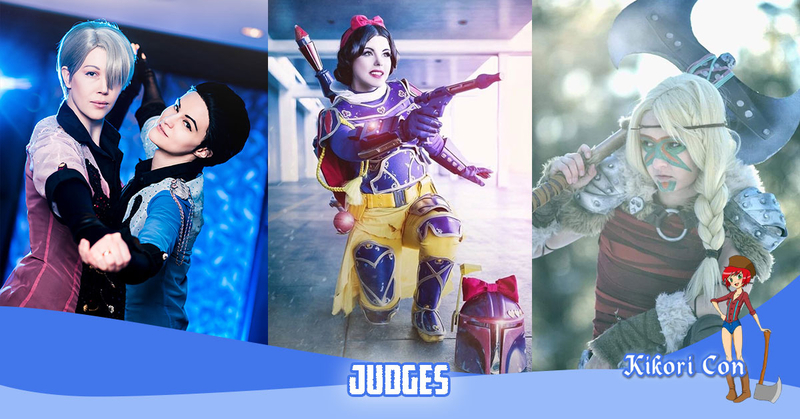 Best known for their portrayals of Dragon Age sisters Hawke and Bethany, Heart and Soul enjoy taking on complex and detailed cosplays. From leatherwork, armor and weapons to finery and meticulous hand embroidery and beading, they’ve tackled a little bit of everything. They’ve taken multiple awards in competitions in America and Canada—Soul most recently competing in the finals for Masters of Cosplay—but it’s meeting fellow fans and artists, finding new friendships and making amazing memories that they really love the most about cosplay.